Google introduced a new algorithm by the name of Hummingbird to the world today at the garage where Google started as a business, during a celebration of Google’s 15th Birthday. Google doesn’t appear to have replaced previous signals such as PageRank or many of the other signals that they use to rank pages. The announcement of the new algorithm told us that Google actually started using Hummingbird a number of weeks ago, and that it potentially impacts around 90% of all searches. It’s being presented as a query expansion or broadening approach which can better understand longer natural language queries, like the ones that people might speak instead of shorter keyword matching queries which someone might type into a search box. For example, the kind of query where it might potentially work best upon could be something like [What is the best place to find and eat Chicago deep dish style pizza? ], where Google might use synonym and substitute query rules in combination with analyzing other non-skip words within the query itself to understand the context of a query term and a potential replacement for that query to reformulate (or replace) the terms being searched upon and provide potentially better results. Google might look at the query [What is the best place to find and eat Chicago deep dish style pizza? ], and understand that a searcher looking for results for that query would likely be more satisfied with the use of “restaurant” instead of “place”. The use of “restaurant” instead of “place” might be considered as a potential synonym or substitute based upon substitution rules which focus upon co-occurring terms that might show up in search results when those terms are searched upon, or co-occurring terms in query sessions. Google’s analysis of different search entities such as the relationships between queries might be identified in some cases as improving searcher satisfaction for search results based upon things such as how long someone might dwell on a page when they select it in a set of search results. Determining to revise the original search query to include the candidate synonym of the particular query term, based on determining that the confidence value the other non-adjacent query term satisfies the threshold. The hummingbird patent tells us that a co-occurrence measure is used to evaluate candidate terms/synonyms pairs based upon how frequently those terms (or compound words or phrases) appear together, or in related user queries (for example, in consecutive queries within a query session) or that tend to appear together in related query results. Google might consider a number of synonyms from a synonym database, to see how well those fit within the context of the whole query. For example, the terms “car” and “auto” are often considered synonyms, especially when they may appear in queries such as [car mechanic] or [auto mechanic], but might not be considered as synonyms within the context of a query such as [railroad car] and [railroad auto]. It’s unlikely that someone searching for [railroad car] would want to have results for [railroad auto] added to those results or even replaced by them. In my post linked to above about “substitute rules” for queries, similar rules for synonyms can also be created, and both can be used to create that synonym or substitute database. That database can contain data about the level of confidence that terms might be synonyms or substitutes based upon things like co-occurrence data, and whether or not they might be synonyms or substitutes based upon rules involving other terms that might be within the same query. 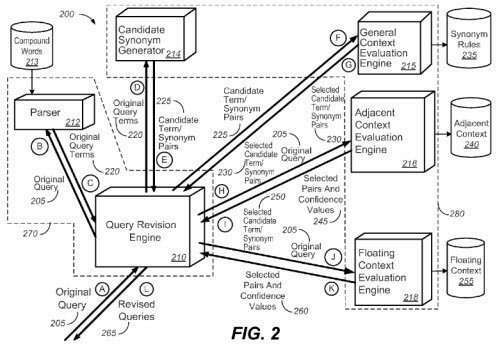 A patent filed by Google in 2005 covers a lot of the same ground and is cited by the patent examiner as a related patent – Determining query term synonyms within query context. I wrote a post about it after it was granted, How Google May Expand Searches Using Synonyms for Words in Queries. So the basic ideas behind this kind of query expansion have been floating around Google for a number of years. While people seem satisfied with typing keywords into a search box, it seems that it’s more common for people to actually abandon their focus on just matching keywords when they perform a spoken query. We’re more likely to see someone typing [chicago style pizza restaurant] into a search box, and someone speaking the query [What is the best place to find and eat Chicago deep dish style pizza?] into their phone. The Hummingbird patent provides a number of additional examples of how the words with a query might be used contextually to better understand other words that might be replaced within that query with synonyms or substitutes. It is possible that the Hummingbird algorithm works somewhat differently than what is described in the claims and/or description of this hummingbird patent, but they seem to be a pretty good match. Is this the Google Hummingbird patent? What do you think? Excellent post as always Bill! I think this update connected with 100% not provided really shifts how we should be looking at pages and will make everything a lot more searcher-focused, rather than search-focused, if that makes sense. I think this also heavily ties in with their Google Glass project and increasing voice search. So it won’t be as much about domain authority anymore I guess, more about co-occurence, describing the domain with correct meanings (schema and your associations with other domains, not necessarily link based). Thanks for the graphs and the links to your other Google patent posts. Oh man if this isn’t the fruit of their purchase of WAVII back in April I would be surprised, just like the article that Matt C put up on his blog about people writing really in-depth articles. I was thinking something similar when it came to the loss of keywords in Google Analytics. An approach that might in some ways significantly influence the query terms that our pages might be found for could cause reporting on keywords much less meaningful to us. Co-occurrence, in all the different kinds of ways it might be used, will likely play a more important role as well. I suspect that many of the ideas that Wavii uncovered might make an appearance in the future as Google’s use of knowledge bases grows, but I don’t think we are quite there yet. Thank you. I’ve been asking myself for a couple of days (and longer considering the other patents) how a writer might be able to use a knowledge of how Google might handle information about search entities and synonyms and substitute terms in queries to improve the quality of their content. Including synonyms within content isn’t a bad start, but I would definitely consider looking through the top 10-20 search results and seeing which terms tend to co-occur within those, and think about adding them. I would also pay more attention to the query refinement suggestions that Google might show in response to a query as well. The question I wanted to ask was, how is the impact so wide (90% of the searches)? Thanks for the great post! This is very interesting and seems like a logical next step for Google. I’ll go back and re-read the previous posts you linked to in the article, but I’m curious about whether you have suggestions for improvements in SEO copywriting and other on-page optimization elements. We’ve been using synonyms for keyphrases in client copy for years now, but this seems to go beyond that. It’s understandable why this answer is tough to return in today’s search environment – it’s two pronged. I want a good bbq restaurant, only/if it also serves craft beer. Not just beer, but craft beer. Bill – Your recent writings about experience cards make me think along these lines as well. The more people have experiences at establishments, and speak/write their own reviews/experiences in normal terms while there – the better Hummingbird will work. I think that https://www.schemer.com/home might also play a part here – but it’s just a bit too clunky right now. It’s not well integrated into Google Plus and Local yet – so not sure if that is the answer. It’s funny though, the layout of Schemer is “card centric” when you look at it. On a side note, I have noticed the term “XXXXXXX near me” coming up a lot in analytics for clients. I did not see this 2-3 years ago. Things like “Chevy dealers near me” or “night clubs near me” – obviously these are mostly mobile searches. All of this ties together and its quite exciting! What are your thoughts on this in regards to driving revenue for Google. These days, I always like to look at that angle. If they’re trying to define searches as more “conversational” and finding “answers” – it seems what they’re really saying is that they want to rank content instead of products. This is nothing new, especially in the past year with everyone being so content-focused now. Is this another way for them to rank content higher to make revenue-generating websites pay for advertising? That, coupled with what Google engineer interviewed in the Forbes article said about how the more people search with these complicated queries, the more the algo will understand and be able to return appropriate results. Will be interesting and tiring to see this how this next stage goes. A informative post about Google’ Humming bird. As you said in the post that 90% of searches have been affected due to this update, then what is the solution for them to come out of it. Thanks in advance. Mike Blumenthal wrote a very interesting piece suggesting that the rash of recent spammy appearances of oneboxes in local might be well connected to Hummingbird. Reporting on this sudden appearance started on 8/24, Google suggested Hummingbird has been in operation for about 1 month and Moz measured a significant change as of 8/22 to 8/24. One simple and astounding perspective on the local spammy results is that they all appear to have exact match domains. If one searches in Maps on the same query that generates a 1 box in general search it tends to turn up a single result in maps. It appears Hummingbird or whatever change occurred was directed at the G Maps index along w/ the G.com index. But seriously….take all the descriptive language away and the one thing that is showing are exact match domains. G Maps seemed to have dealt with that several years ago. Seriously the onebox results are terrible. If you are searching for a plumber in a certain city you don’t want 1 result. You want a variety of plumbers. On top of that the results that are surfacing are sometimes old urls that no longer even connect to a real business. It appears that the update unleashed an old problem connected to weak non helpful ways to spam G Maps. If Google’s approach under Hummingbird is to process queries differently than they had in the past, then it’s going to impact the majority of the queries that they see. Thanks. It’s hard to say how well Google might adapt to the kind of query that you’re asking which is using a natural language search query that has multiple parts. The problem might not be with Google and the way that it is trying to parse your query, but may be more closely related to a lack of results that fit, or a lack of websites for that that might include that information on their websites or menus. It is possible that something like the experience cards might add that kind of data to information that can be found on the web. I just did a search for nearby BBQ places, and looked through their websites, and saw no references to what kinds of beers they served, if any. The “near me” results you’ve been seeing probably are from mobile results. I think it’s a mistake to look at everything from Google in terms of what it might mean to their revenue. I think Google is more likely anticipating a time when more people perform spoken queries on a phone. If you want to put some economics into that area, the growth of mobile access to the Web is growing tremendously, and it makes sense for them to adapt to the way that people perform queries with a mobile device. Google has been answering Q&A type queries since the early 2000s. There’s no easy way to use schema for most Q&A type questions, for most website owners who don’t design websites that are mostly databases in disguise. Thanks. The focus of Hummingbird clearly appears to be on using a different approach to parsing queries, and using things like co-occurrence in query session logs and search results to understand candidate synonyms and substitute words for terms that appear in longer and more complex queries, so that those can be rewritten. The more that Google expands queries, and gets to use feedback from people looking at results from their re-written queries, such as how long people stay on pages in search results from these expanded queries, the more data they have on how effective their approach is. That goes well with the quote in the Forbes interview. It’s definitely going to be interesting. One of the very real and insurmountable problems with trying to understand the impact of a significant change in a search algorithm is that it doesn’t happen in a vacuum. To quote Amit Singhal, changing an algorithm like this is very similar to replacing the engine of an airplane while it’s still up in the sky. Mike’s article doesn’t call these “spammy” one box results something new, but instead something that seems to have made a comeback after being spotted (and seemingly addressed by Google) a number of years ago. 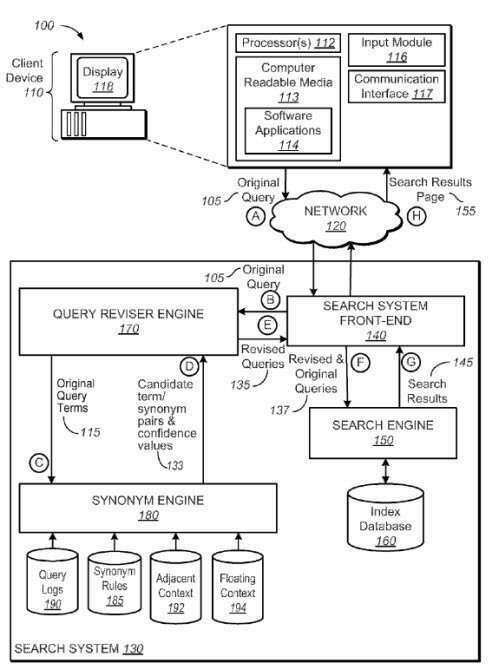 From my reading of (at least 4) recently granted patents related to query expansion and rewriting from Google, including this one which seems extremely related, signals involving local search (or schema, or even knowledge-base signals) aren’t part of the process of expanding queries under Hummingbird. That doesn’t mean that queries might not be re-written in ways that might cause some issues with local search results. Chances are good that any negative repercussions that might be seen weren’t something purposefully targeted by Google, but actions sometimes have unanticipated results, and it’s possible that the way that Hummingbird might be re-writing some queries might be triggering some unintended results. Then again, the problem with Local search results might be completely unrelated regardless of the timing that Linda and Mike saw. We know that Google has made at least 500 changes to their ranking algorithms over at least the last 2-3 years, which is more than one a day. Chances are very good that Google’s presentation of information in one box results depends upon whether or not people click upon those results, and if people stop clicking upon them, they either might stop showing or change what they show. It’s likely that is a self-learning process for Google, and those particular one-box results may need to be retrained after this change to queries. I wrote that Google stated that Hummingbird would impact 90% of queries. There is no “way to come out of it.” This change isn’t like Panda or Penguin, which penalizes some sites. But, it might be doing a better job of presenting higher quality results based less upon strings of words within queries, and more upon the concepts and ideas found on pages presented in search results in response to those queries. Thanks. There’s really not a simple way to put this. It’s not a simple process. It doesn’t involve Google’s Knowledge Base results, or showing more one box results or showing more “scraped content” the way that many people are claiming it does in blog posts. Hummingbird focuses upon a better semantic understanding of the words used within a query to reforumlate (or re-write) and expand that query, and try to get better results especially for longer queries that might be something a person speaks instead of just a number of keywords. Google can begin this process by looking at a database of synonyms and substitute terms that it might use to replace one or more of the terms in a query with. It does this by looking at a large set of synonym or substitute rules that have been developed by looking at how different search entities might interact. The way those synonym or substitute rules are created is through examining what people search for during query sessions, where some of the same words are used. If two queries are submitted by the same searcher consecutively, that may be a hint that the words might be considered to be synonyms or substitutes. For example, someone searches for “how to become a dentist,” and looks at some results and then searches for “how to become a dental assistant.” That means that “dentist” and “dental assistant” might be considered to be synonyms within that context. Google might also look to see if there are a lot of co-occurring words that show up in search results for a pair of terms. Search for “car repair” and look at the top 20 results, and then search for “auto repair” and look at the top 20 results. If a lot of the same words show up in those results for both terms, they might be considered to be synonyms or substitutes for each other. The Hummingbird process involves exploring possible candidate synonyms or substitute terms like this, but in the context of the whole query. So, if the query is something like “tell me a place to buy pizza”, Google might try to identify possible candidate replacement synonyms or substitutes for “place,” and it might then test those to see how likely it is that a synonym or substitute for “place” might fit with other meaningful terms in the query. It might ignore “tell” and “me” and “a” and “to” (calling those “skip” words) and focus upon the words “buy,” and “pizza”. So, it might consider possible candidate synonyms such as “restaurant” or “store” or “finish” (as in someone “finishing in first place). It might combine the candidate replacement synonyms with the other words within the query, so we might see restaurant/buy, restaurant/pizza, store/buy, store/pizza, finish/buy, and finish/pizza. It might look at how often those words tend to co-occur in search results or in query suggestions, and determine that there’s a very high confidence level for “restaurant” and “pizza” to tend to appear together, above a certain threshold. 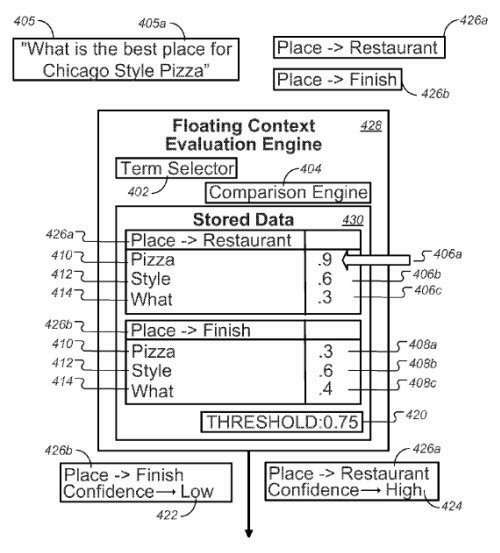 Google might not see the same high level of confidence with the pairs of restaurant/buy, store/buy, store/pizza, finish/buy, and finish/pizza. So, because of the high level of confidence, Google might decide that replacing “place” with “restaurant” in the query is a good start towards answering this query. It will probably also drop the “skip” words out of the query as well. So, “tell me a place to buy pizza” is reformulated or re-written as “restaurant pizza” or “restaurant buy pizza”. Under Google’s old method of responding to a search result for a query like that, it would probably respond with local “Google Maps” results and with some local Web results as well. So the main difference between the old approach and the new approach is that Google is using statistical language approaches to better understand how it might re-write queries to make them simpler and more likely to provide good results. It’s not looking for keyword matching as much as it would have before, so it would be concerned with only returning pages that had all of the words in the query, and would use something like “restaurant” instead of “place. I did link in the post above to three other posts that I wrote about earlier this month and last month that discuss re-writing or reformulating queries and using co-occurrence in different ways to do that. Between this patent and those three, they point to query reformation as one of the major drivers of the kind of change that Hummingbird brings. This patent especially focuses upon announcing a query refinement or replacement like that one which was used at Google’s 15th anniversary celebration, describing Hummingbird. Woah. Thanks for the jam-packed answer Bill. Can I quote you on that and publish your input in my blog? It’s probably going to be the nearest simplification I can get out of what exactly makes Hummingbird tick. Thanks for taking prompt time to reply this! You’re welcome, Sean. quoting me on that in your blog would be fine. The patent describes a process that is very similar to the small amount of information that was shared with us about Hummingbird, so its possible that some of processes might be different in some ways. Then again, chances are really good that when Google implemented PageRank, they made some changes from their original white papers and patents that describe how it works, too. The basic focus does appear to be on query reformation though, in a way that does involve modifying longer and more complex queries. Keep in mind that my examples might not necessarily return results like I described – I don’t have access to Google’s query logs or the co-occurrence data in them, or the co-occurrence of words in search results. Great job outlining this! Help me out here, can you put in simple terms, what the difference of Hummingbird is from Google’s old engine when it was also serving up these kinds of synonymic results to users? Or am I mistaken that it used to be synonymic and now it is? Pingback: Comment Hummingbird reformule vos requÃªtes ? Thanks for the heads up. Based on how you describe the synonym element it appears that web pages may rank for a search phrase that they don’t actually mention at all and are not optimized for. Does this mean that the competition gets tougher as higher authority sites will start to compete on phrases that previously they were not ranked for, squeezing out lower authority sites? Great post. Does this impact all languages or is it English/US only for now? The original query used by a searcher may contain terms that the sites being found don’t contain after the query expansion process, but Google isn’t necessarily searching on the terms used in that original query. When Google started showing results that contained synonyms, did that increase competition, and favor “high authority” sites? Probably not. Same thing now. What is a “high authority” site? A page with a high PageRank? The page still needs to be relevant for the query terms used. I didn’t see anything in the statement from Google about Hummingbird that it was limited to only specific countries or regions. Thanks for the detailed information in this blog. Overall, this sounds like a good change that will help users better find what they are looking for. And, thinking about it, it seems like this is a natural progression of what Google does, especially in the context of voice commands as you insightfully pointed out. As far as SEO, I’m not sure I’m seeing any downside yet. If my pages don’t show up in the results of a query any more, it might just be that my content is not what the user is looking for. So there seems to be a lot of concern about this change, but I’m really not too worried about it. I suspect the spammy oneboxes are an after effect of changes, not something done purposefully. Per Linda’s blog and thread on the topic Google has been taking down examples that surfaced. 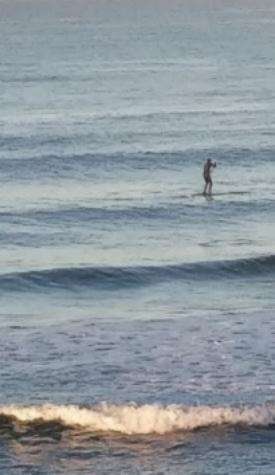 It is I suppose an unexpected consequence of changes made in the algo’s whether its hummingbird or some other algo changes. Over the years I’ve been a part of some of those onebox issues. Generally but not always they coincided with an smb that either had a business name coinciding with a major local discovery search term, and/or a url that coincided with the basic discovery search term. At its most basic a term is something like service/city or city/service or city/product or product/city Philadelphia Dog Walker (inc) and/or philadelphiadogwalker DOT COM are the types of smb sites that often turned up one boxes for the most popular search phrase for the services. Is it aggregate clicks on the site or some over reliance within the algo on url or anchor text links to the business name (which is the url–and the #1 search phrase). Or is it all of the above? Don’t know. A onebox presents problems to people doing discovery search for a variety of services. It also crushes the other dog walking services. But admittedly the “meaning” of the search is ambiguous. The timing of the spammy oneboxes coincides with when hummingbird supposedly came out. It could well be an interesting but unintended consequence of the change or any other algo changes google makes. Good blog post and very interesting pictures findings from patents. Anyway do someone know how much is voice searches %ge from total searches? Okay this is some seriously good stuff. Google Hummingbird patent? Haha~ Nice images you have too. Well said and thanks for sharing mate. I’ve seen rankings drop and other sites that were just launched 30 days ago now ranking #1 for keywords my clients ranked for. Is this Hummingbirds fault? As you suggest towards the end of your article, people have become so conditioned to typing keyword-stuffed jumbles of words into a search box in order to make their question conform to search engine processes. Hopefully hummingbird will encourage a transition to more natural language when it comes to typed search as well as spoken searches. Overall, it sounds much more intuitive. Hi Bill, Good inferences. I liked the Hummingbird image which you have created. Most of the sites are affected by this update and hopefully this will bring changes for both webmasters and searchers. Both will start looking to use natural language rather then keyword stuffed pages and searches…. Thanks for the post Bill. It will be interesting to see how this pans out over the coming months, in particular to see just what percentage of searches are actually being affected by the hummingbird change. Bill, I read quite a ways down but did not see anyone discussing the recent occurrence of rel=author images showing up next to people’s profiles in instagram and other social networks in Google search. Given this phenomenon, along with the patent filing, and the one box sightings, perhaps we’re seeing an advanced co-occurence algorithm that goes beyond text? It could be that they are just using verifiable signals to assign the rel=author to social media I suppose, but it would make sense that if they were going to rebuild their engine from the ground up for the future that they would want it to be able to better understand all data, not just language. If this were the case, we should prep for verified associations to become signals of credibility. God knows we have all suspected that rel=author would become one soon enough. I’m not sure why people need to have the Hummingbird update related somehow to Google’s knowledgebase updates, but the hummingbird update doesn’t have to be related to them in any way, and likely isn’t. The same with the one-box updates that were also announced at Google’s 15th anniversary, but otherwise are likely independent of them. Nothing in the announcement said that they were related in any way. The same with rel=author. This seems to be linked with using search to solve questions. If we could find a natural way to frame a question, then this will help Google especially as we move into more voice activated queries. Pingback: SEO: Google Hummingbird Update - What does it mean for you? This makes total sense, especially when diagnosing where we are and what mindset we are in while we perform our searches. The more that cell phones are used, the more they are a part of someone’s every day life. Yes, we also use our computers often and for personal reasons, but if you look at the way that someone uses a phone, where they keep their phone, it’s easy to understand why the queries and results are in a Q/A format. You couple that with the fact that we “ask” Siri…we’ve turned searching for things into a conversation with Siri (for those of us that have iPhones). A deep analysis about HummingBird and I believe that these updates, in fact it would be better to say, frequent updates seems to be a part of Google’s revenue model. They are trying to make the things better so that they can earn more trust from the market. More trust directly relates to more business, more revenue and more profit. Their latest updates on hummingbird as well as Panda just seem to be important steps towards their marketing strategy. Thanks for sharing such deep insights about the topic. Great post and lots of great responses. It does kinda make me think though….back to the real basics, and based on Siri on the iphone search results (answers). Could it mean that Google will show more advertising results via mobile based on a longer tail ‘probable’ search term? So more paid Ads get clicked on mobile devices because Google displays them with this new algo? Not many business owners will be optimising their websites for these longer tail obscure search terms. I get it…..but would like to see it in action properly. Hope it is just not me thinking this!! Thanks for the great insight into the Google algorithm! This particular algorithm seems to be more logical then the previously proposed algos. I have missed your previous articles related to hummingbird update. I will probably get a better context once I go through rest of the articles. Your articles always bring something new to the table. Keep up the good work. Nice post Bill. It’s evident that Hummingbird, Penguin, Panda et al are the best things to happen for reputable SEO people. From my own perspective the recent changes have really helped my white hat business as I am seeing local SEO clients come to us due to the under-hand SEO tactics they were previously sold in by other agencies. Always love your take on the Google updates. When Hummingbird was announced I made a mental note to come digest what you had to say. I think your assumption (or plausible theory) that Hummingbird correlates with potential synonym guesses and substitution rules is sound. From a business owners perspective, and I am by no means an expert on SEO, this is really good news that Google is taking these steps. I’ve recently entered a relatively competitive market in the last five months and have been struggling to get the kind of online visibility that brings in enough customers. Over the last two months I’ve seen a lot of the competition start to drop off the search engine rankings. A friend who works in SEO introduced me to a tool called AHREFS and it’s been interesting to look at the backlinks my competitors have. Almost every single one of them has been using really spammy looking websites to rank. The months I’ve spent building relationships and doing online interviews with business forums in order to get good quality links now seems to be paying off in the last 60 days or so. Obviously some of my hard work is paying off, but it seems like my competitors quick win approach to SEO has seen them now suffer. Will be interesting to see how the Hummingbird changes start to affect them too after the Penguin and Panda things. Great post! I’m writing a blog about digital marketing predictions for the new year and this is exactly what I needed to know about Hummingbird and content marketing. I find it amusing that everyone was so up in arms over this change when it actually went into place a couple of weeks before it was announced. I knew a ton of SEOs that were scrambling to find out all they could about the “latest evil algorithm update” from Google. I think that if SEOs and webmasters in general focused more on delivering valuable content to their readers instead of worrying about how they can possibly “game the system” then any potential algorithm change will do nothing but help their results. After all, when you think about it from a consumer perspective instead of our side as SEOs, this algorithm really does make sense with the massive shift towards mobile internet usage. What do you think? Hummingbird has served to separate those SEO’s who chase the money and those who serve their visitors by providing value (the latter being the better long term approach). Next Next post: Google Scoring Gibberish Content to Demote Pages in Rankings?